It's time for some more glimpses of the shop! Last time, I showed you a few of the items in the Vintage Paper Goods category. This time, it's Trinkets & Treasures. The third category is Fancy Notions, and I'll post some photos from that category next time. It's official! August 1 is the Grand Opening of One Hundred Wishes. Yes, that's next Wednesday. Yes, I'm nervous. Yes, I'm going a bit crazy! It will all work out though.....I just know it will. Breathe, Andrea, breathe. If you haven't already, you may want to sign up for the newsletter (over there in the right hand margin) to receive updates and news about the shop and the latest goodies in store. I promise, there will not be a ton of newsletters filling your inboxes. Just a few here and there to keep you in the know. I love found objects. Random little things. 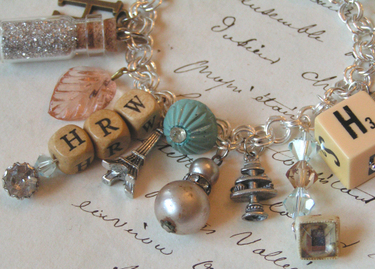 A couple of years ago, I made this Found Object Charm Bracelet for myself and am so pleased with the look. I always seem to get compliments when I wear it. It's one of a kind, of course, so that makes it all the more special. 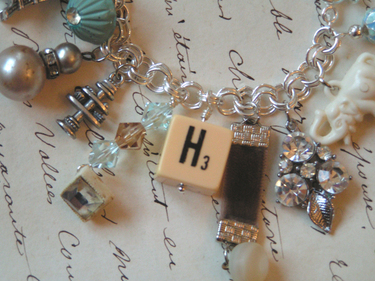 I'll be offering similar bracelets in the shop! I've been busy finding and creating unique items to dangle from these sterling silver beauties. Shiny and sparkly and vintage! 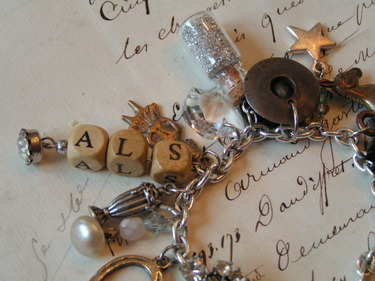 And, you can even get them personalized with your initials or a short word if you'd like. Earlier this week, I made this one for Hope because she's a peach and has helped me achieve this dream of a webstore. It truly wouldn't have happened without her. She is infinitely patient.....a good quality to have when working with a girl who changes her mind as often as I do. I hope she likes it! It's going in the mail today. 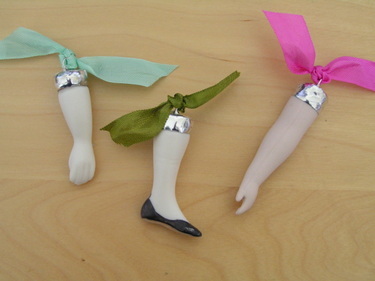 These whimsical soldered doll part charms will also be sold in the shop. Below is a picture of a trio I crafted for a special order a few months back. 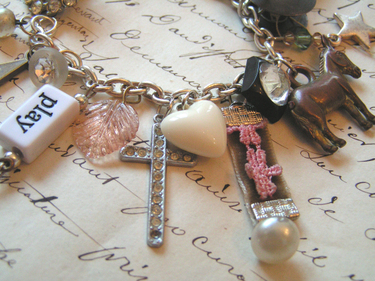 They're fun to wear on a chain, dangle from a doorknob, or tie to a special gift. Trinkets & Treasures also includes a Vintage Millinery section including an ever-changing assortment of corsages, hats, and other scrumptious old millinery goods. You never know what you will find here. So, there you have another little glimpse of my store's offerings. I hope you enjoyed it, and I'm looking forward to showing you some Fancy Notions the next time I post. These are some of my favorite things and many of the supplies that I use when I am creating. Thanks for taking the time to read all the way down to this last line. Enjoy the day! Andrea - I'm so excited for you! Can't wait for the grand opening! 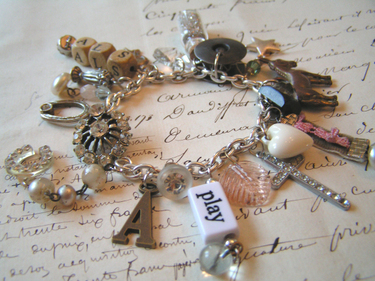 Love the bracelets - I've been wanting to make one of those myself but have never gotten around to finding all the charms and the time - I can't wait to see the ones you'll be offering. 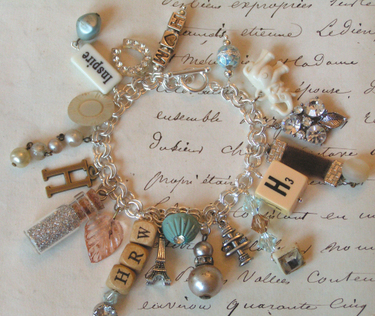 That charm bracelet is simply adorable! Can't wait till the shop is open. 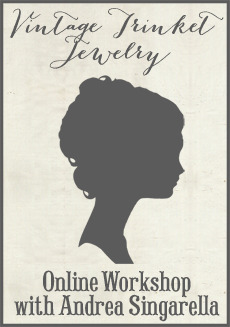 Your store is going to be a hit, and with the release of Artful Blogging being August 1st as well, people will be flocking to your blog and store! So cute. I love it all. It is all very exciting!! ...i am so scared that all the shop goods will sell, and I can only find an empty shop *grinning*! What wonderful treasures you are creating. It's going to be so fun to see them all together. Amazing work, Andrea. You are such an inspiration. I'm getting more and more excited by the day for your shop!!!! Gorgeous! You have NOTHING to be nervous about...except for maybe handling the deluge of orders you are going to get for your beautiful things. I am sooo looking forward to the August 1st Grand Opening. Can't wait till Aug. 1st! The bracelets are beautiful!! I'm new to blogging and your blog. I'm so thrilled to have stumbled upon your blog at this moment-- when dreams are coming true! It will be exciting to watch your business grow. And, the timing of Artful Blogging is just another plus! I can't wait for your shop to open. Your teasers are wonderful! Andrea, I love what I've seen so far. I am sure we all can't wait for your Grand Opening. Regards, Kim. Love, Love the bracelets! Can't wait till you are selling them. Congratulations! the hardest part is over, that leap! your pieces are so sweet and lovely!! Oh hurry hurry!! I can hardly stand it! It is truly fun to witness someone's dream coming true!! Your work is fabulous and your store is going to be a winner! All of it is absolutely adorable~ cannot wait for the store to open next Wednesday! I'll be first in line!